The first and most important step in fitting a garment is to position the backseam/ neckhole crosspoint exactly on the 7th vertebra, the protruding point. Everything starts here measuering and fitting. The CB neckpoint is the only point on a body, that can be identified precisely. It is the protruding 7th vertebra. It is the only reliable reference point. Here we start measuring, here we start drawing, here we start fitting. All the rest of the jacket, each point of the pattern has to be put in the right position relatively to this point. For fitting this means the only thing we know is, this point of the garment has to sit on exactly this point of the body. That´s why we pin it there. Everything else is unsure and has to be adapted when not fitting. 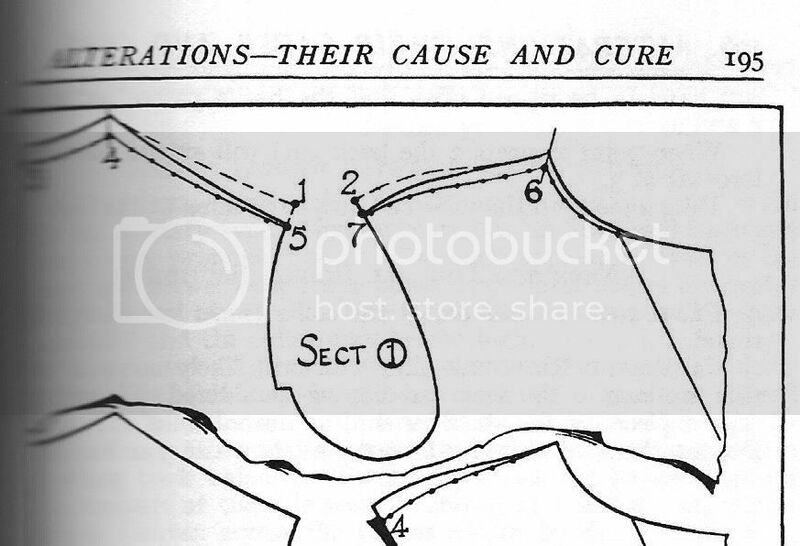 So the intersection of the CB and collar seam of a coat is not to be touched in fitting. Peterle seems to be saying it is not to be altered under any circumstances. Change the whole rest of the coat if necessary, but not the back neck. Now, I'm sure peterle has forgotten more than I ever knew about fitting, as has recently been demonstrated . But I just can't reconcile these two concepts. If the point mentioned can never be changed, how can this alteration happen? How can you cut away a point which cannot be changed? And if the alteration is OK, then maybe the first thing in fitting in such cases is to make corrections to the back, so the new CB collar seam lies in its proper place? Or is this old book out of date? Not the neck at the centre back seam though. I thought you didn't want to learn from books? My thoughts are what fits, and change the rest to fit. Suppose the armhole and chest fit, but not in the right place. Maybe it is easier to lift or lower the neckline so the armholes and chest go where you want them. Maybe the garment needs to be rotated around the armholes. Or, is it easier to sew the dart different? Do you want to reshape the armholes to the new location? If you are using a proportionate system of drawing the pattern and the customer is not proportionate (which who is), then the pattern needs to be adjusted before cutting, or more time fitting with larger inlays. Poulins 70s book has a proportionate system. But, he shows measuring for armhole depth. After drawing the pattern you can check the scye depth and then move the neckline up or down to a better location. He also shows adjusting the neckline for stooped or erect by lifting one and lowering the other. Then, cut the paper pattern. After the fitting the paper pattern gets adjusted again. Are these books written for confusion to those outside the trade? I've been learning from books all my life, thank you. But this particular book appears to contradict what I was told by an experienced professional. So which is right, or have I misunderstood yet again? This is why I think it takes more than just going off and reading books by yourself. How did your grandfather deal with this ? This may sound like comments from the "peanut gallery" but there is another factor that I have seen in most very good tailors, almost all of them have a very good grasp of what you would call in modern parlance "3D geometry". Much of what is being addressed as problems comes from the level of abstraction when dealing with block patterns designed for grading and unless a reader is privy to a large number of assumptions, the transfer from design to fit can be a traumatic experience. In mediaevil times armourers made "clothing" for knights out of metal (suits of armor) where they had to bash each piece into shape by hand then rivet or weld the together to make the "garment". What this had in common with more conventional tailoring tasks of the modern era is a grasp of 3 dimensional shapes so the suggestion is to try and get under the form of the block pattern and try and get the swing of how and why it fits a particular individual. There are many other considerations, posture, pot guts, sway backs and so on which need to be taken into consideration when designing a garment for a person and these will all be modifications of the 3 dimensional geometry to fit a particular person. I don't think Peterle overlooked this at all. He'd know very well that such alterations as passing up the back and changing the shoulder seam would necessitate changes at the back neck. The method above didn't take in consideration of full length of coat. The saddle method is very accurate, simply and fast. You probably best add half an inch. Have your wife take the measure. This has nothing to do with fitting my jacket toile. I'm asking about the principle - is it OK to move the collar seam line or not? The consensus so far seems to be yes, at least in certain cases. Think Peterle was more concerned about the back seam being off to the side and other concerns that he had no control over. When the garment is not sitting properly for a fitting, and one tries to fit, it is a wild goose chase. Nothing is accomplished. Dashing from the camera into the picture is a problem. It's just one of those things. Of course the back neck point can be changed as in the illustrations you posted. Lets say if the shoulders are very square and the jacket is not, then the excess fabric will be evident at the back neck. I think it depends more on where you are in the process. In a finished jacket dropping the cb neck and the neck point and reshaping the back shoulder line is much easier to do than taking out the back of the sleeve, unpicking the side back seam ,passing the back down, correcting the hem, then putting it all back together. Peterle seems to be saying it is not to be altered under any circumstances. Never place the CB Point on a different place then the 7th vertebra(=lower shirt collar edge) when fitting! What I wanted to say is: it is important that the neck point is on the right place for fitting the jacket . Only in this position you can judge wether the back is to long or to short, armholes deep enough or not, sloping of the shoulders to steep or shallow. It has nothing to do with changing the neckpoint for the alteration. When you are convinced what is to be altered, there are usually different methodes to reach the same result. Fitting shows the back balance is too short. In the paper pattern you will cut the pattern midway between neckpoint and chestline and insert a strip of paper across the back pattern to lengthen the distance between chestline and neckpoint. This method avoids any other changes like redrawing the armhole or the shoulder and neck line. it´s fast and tidy. You can´t do this in a yet cut back piece, so you need a different method. Having inlays at the shoulder/neckline (wich is very uncommon) you could redraw the hole shoulderline neckline a few centimeters above the original one. this will also give you a longer back balance. In a toile you could have added an "Inlay" across the back by lengthening the back balance in advance to have additional fabric just in the case of... this "inlay" would be basted for the first fitting. In a cut back piece without this inlays there is only one method to lenghten the back balance: you have to connect the back piece a bit higher at the side seams. This makes it necessary to redraft the armholes . The waistline and the hemline will be a bit higher, they have to be redrafted as well. This can also be a catastrophy when you have to match plaid, or not enough inlay at the hem. So it´s always a question of the situation where to execute a necessary alteration. You won´t have this problems when your back balance is too long. You just would redraw the hole shoulder-neckline a certain amount below the old line. Of course you can alter the Center Back point. Sometimes you even have to. But when you fit the new version, the new CB point has to sit on the same spot of the body as the old one did.